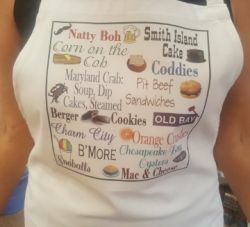 This handmade apron is perfect for any food lover - features beautiful typography of signature Chesapeake foods. Machine wash cold. Handmade in the USA. 2910 on the Square exclusive! !